Queensland’s new expansion clubs, the Crushers and Cowboys, got off to losing starts in the 20 team 1995 ARL competition on a weekend when news broke that News Ltd would continue its assault on the code. ARL bosses, Ken Arthurson and John Quayle and invited guests were on a celebration lap of Australia and New Zealand when it was confirmed a ‘Super League War’ had indeed been declared, despite earlier assurances to the contrary from News Ltd, who were now in the process of poaching players and/or entire clubs for a rebel competition. The first match of the weekend was in Auckland, where the Broncos beat new boys, Auckland Warriors and the last match in Perth, where the Western Reds recorded the only win among the newcomers – a stunning result against St George. But there were no fairy tale results for the Broncos new rivals in the Queensland market. It was the Crushers who ran out first – against Canberra Raiders at Lang Park on a Saturday afternoon – and despite leading 6-4 at halftime, they could not hold off the star studded Raiders. Canberra utility, Jason Croker played 35 minutes in reserve grade after being demoted for disciplinary reasons, but ignited a Raiders’ second half comeback in the firsts, scoring two tries. Fullback, Brett Mullins also played reserve grade as punishment for the same incidents at training and a sponsor’s lunch, but he sparked things in attack as well, scoring a spectacular try. Trevor ‘the axe’ Gillmeister had the honour of scoring the Crushers’ first premiership top grade try. The crowd was 21,102, almost 5,000 more than the Broncos’ debut home game against Manly in 1988. It seemed Brisbane longed for a second club. Former Wallaby forward, Garrick Morgan scored a try for the Crushers in their 30-4 win over Canberra in reserve grade, and looked good. British Test halfback, Mike Ford, now coach of Bath Rugby Union, created a try for utility, Terry Cook with a clever grubber kick. The Crushers considered citing Raiders’ halfback, Ricky Stuart for use of the forearm to the head of young forward, Jeff Wittenberg in first grade, but opted against such a course of action. In Townsville that night Canterbury-Bankstown beat the Cowboys 32-16 with North Qld centre, Adrian Vowles sent off by referee, Tim Mander for a high shot on Matt Ryan in just the third minute. Canterbury’s Test forward, Jason Smith was sent off in the 19th minute for a high shot on Wayne Sing. 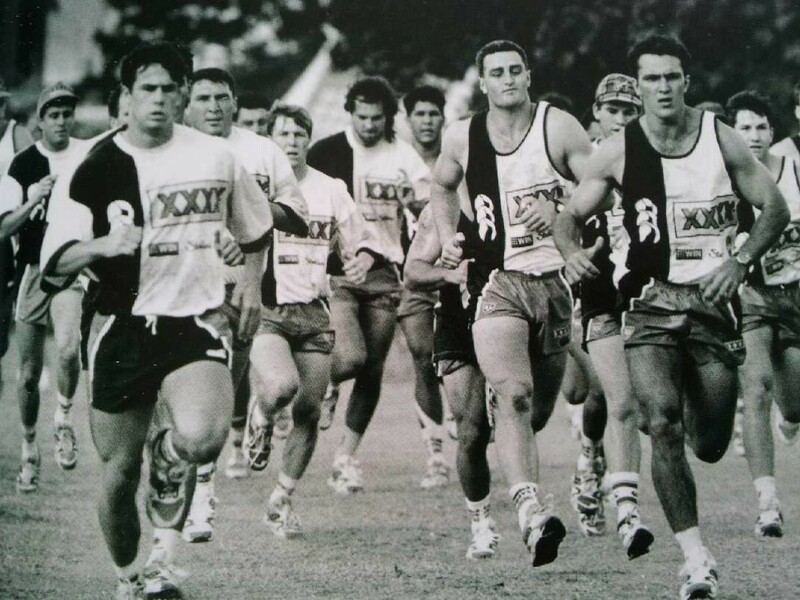 <pic>North Queensland Cowboys’ players train in their debut 1995 season.